All 428 Cobra Jet and Super Cobra Jet engines were originally equipped with a pair of stamped steel lift hooks that were used to lift the engine during the installation process. 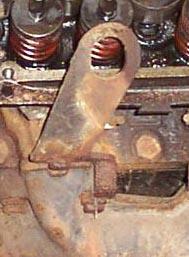 The most common left side hook is roughly figure-eight shaped, carries engineering number C8OE-17K004-B with the circular Ford logo, and has two lifting holes. The most common right side hook is triangular, carries no engineering number or markings, and has a single lifting hole. 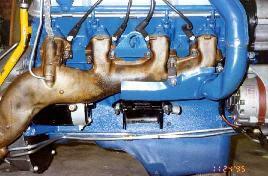 Both hooks were painted engine color, "Ford Dark Corporate Blue" (note that they were painted off the engine). 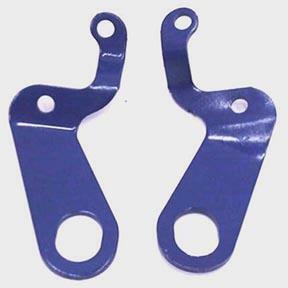 An excellent reproduction pair of these lift hooks is available from many parts vendors. JD Larson of All Classic Motors and others have let me know that these aren't the only hooks originally used, though. According to JD, the driver's side hook used on 1968 CJs is slightly different: "the driver's side has two dog leg bends instead of the one shown on your 1969 hook. The stamping number on the '68 is the same except it has a dash A suffix". JD also noted that some 1970 CJs came with another driver's side hook altogether: "On the '70, I have seen a car that featured both sides using the triangle hooks. The driver's side was not exactly the same as the passenger; in fact, it was a mirror image. This arrangement provided for a centering of the lifting chain assembly." 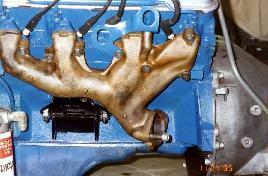 The pictures below show both lift hooks as mounted to the exhaust manifolds. Thanks to Joe Sikora for permission to use these pictures. The left side hook mounts using one of the exhaust manifold mounting bolts around cylinder number 7 and a second bolt that attaches the hook to the top of the exhaust manifold above cylinder number 7. 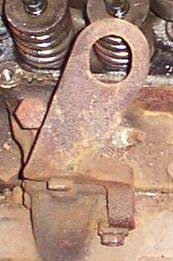 The right side hook mounts using exhaust manifold bolts on the back side of cylinder number 2 and the front side of cylinder number 3. Ford documentation notes that the first 50 "135"-series Cobra Jet Mustangs used exhaust manifolds from Ford's 1968 390 engine. You might think that those cars would also have come with 390-style lift hooks, and you'd be right. Here are some shots on an unrestored engine. As far as I can tell these lift hooks are identical from left to right and are thus interchangeable. 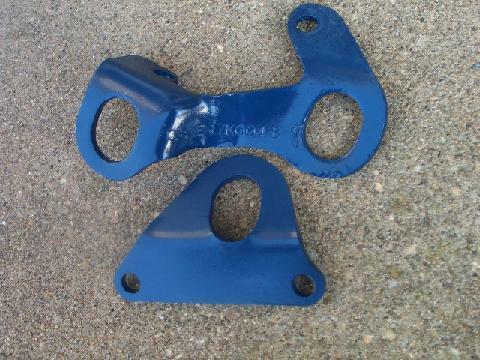 Thanks to Royce Peterson for the pictures of the used lift hooks, and to Bill Upham of Mansfield Restoration Parts for the picture of the restored lift hooks. JD Larson notes that these 390 hooks were also used on the 1968 and 1969 390 GT and the 1968 428 GT500. The hooks used on 1967 390 GTs and 428 GT-500s are yet again different. I've received a report describing early 1968 Mustangs and Shelbys that might have come with a different left-side hook that looks similar to the common triangular right-side hook. Does anyone else have any information or pictures that might confirm this report?